This past weekend the Lucas Oil Off Road Racing Series (LOORRS) made its way back to the Lake Elsinore Motorsports Park for rounds 3 and 4. The newly built track featured massive elevation changes, huge air, and unique dirt that provided a very unpredictable racing surface. The teams piled in on Thursday and prepared for the weekend battle that lay before them. The weekend kicked off with the premier Pro-4 class. Team Associated’s Kyle LeDuc was looking to keep up his momentum after coming back from his sweep in rounds one and two in Firebird, AZ. When the green flag flew, Kyle took his front row starting spot and never looked back. Running away from the field, he gained a large lead and set into a comfortable pace and cruised into the checker flag in the top spot once again. Following Kyle was the #10 of Greg Adler in second, and the #22 Hart and Huntington ride of Josh Merrell finished up in the third place. After a long night of repairs for many teams, everyone threw their best effort on the table to see if they could knock the #99 of Kyle LeDuc from the top spot to claim a win on Sunday. With Kyle starting in the third row, he had some work to do. Picking trucks off one at a time, Kyle found himself on the back bumper of his brother Todd, and they battling for the lead. With an opening showing itself, Kyle took the opportunity to pass Todd and claim yet another win in his Monster Energy/Team Associated Pro-4. That’s four in a row for the #99! Saturday’s Pro-2 race was filled with highlights. Lucas Oil and Team Associated’s driver Carl Renezeder started on the second row and looked at grabbing a podium finish in the stacked field. Drivers were fighting for every inch on the track and after 18 laps, only a few truck lengths separated the top drivers. 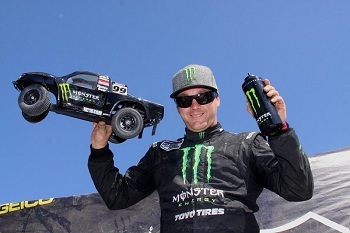 When the checkers came down Carl Renezeder had driven his truck into a third place finish closely behind Brian Deegan and Marty Hart. The LOORRS Season continues and heads over to Speedworld Off Road Park in Surprise, AZ for rounds 5 and 6 on May 19 and 20, 2012. Come check out the hard hitting action that is Short Course, and be sure to check out Team Associated at www.rc10.com for up to date racing news, highlights and photos. Till next time, Take Care! If you like this article, check out this additional article on LOORRS.